Soft Cover, 256 pages, 8.0 x 9.5. For years, Sam Calagione, owner and founder of Dogfish Head craft brewery, and Marnie Old, a well-known Philadelphia sommelier, have been at odds over which drink is more deserving of a place at the dinner table. 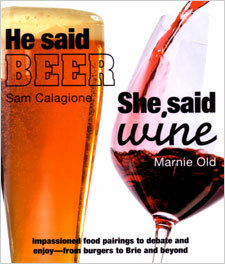 �In He Said Beer, She Said Wine, Sam and Marnie cover the storied history of both beverages, walk you through how to effectively taste and evaluate beer and wine, and offer specific recommendations for pairing drinks with everything from brie to French fries. Each author divulges the secrets of their respective trades, using clear, easy-to-understand language and, of course, a little good-natured banter to keep things lively. The book is full of fantastic tips and tricks, specific beer and wine recommendations, and interactive elements to help you identify your preferences along the way. So, from cheese to dessert, you'll always know what drinks to serve for sublime flavor combinations. You'll also learn how to host an at-home version of Sam and Marnie's sold-out beer vs. wine "pair-offs," with recipes and sumptuous beverage selections to deliberate with friends. The result is a fun, educational and revealing look at how what we drink can bring out the best in our food.